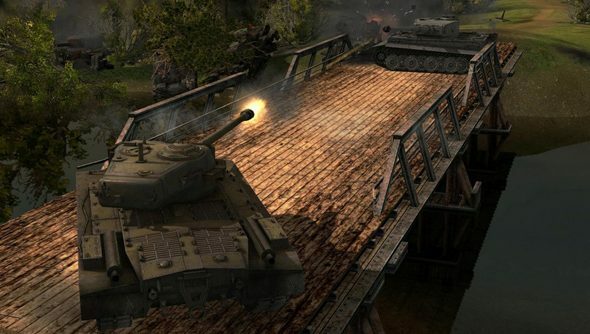 Update 7.5, the one with all the tanks in it, especially all the big, scary, tier 10 medium and tank destroyer type tanks, has just gone live on World of Tanks. That is, if you live in Europe. If you’re in North America, it’ll be out on the second of August, which is tomorrow. We’ve detailed 7.5 a whole bunch previously, but what it boils down to is that almost all of the different nationalities in World of Tanks are getting some new tanks, with the entire French tree getting a reshuffle to better suit each type of tank to the appropriate tier. More importantly, there are a trio of new maps, all of them taking place in North America; Port, Highway, and Serene Coast. More lovely terrain to litter with tank corpses, which, once 8.0 hits, you’ll have counted for you with that lovely detailed after action report that’s on its way. Maybe after that we can finally have the British tanks.